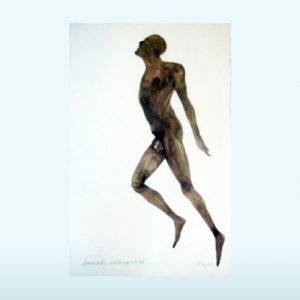 Dame Elizabeth Frink was born in 1930 in Thurlow, Suffolk. The daughter of Ralph, an officer from the 7th Dragoon Guards and of the renowned Indian regiment. From an early age, Frink developed a love and fascination for the outdoors. She was competent in riding and shooting and adored dogs. These actions all of which were, at the time, considered male attributes and activities. This could be the reason why her fascination with masculinity would become a dominant feature of her art. Frink studied at Guilford and at the Chelsea Schools of Art between 1947 and 1953, where Bernard Meadows and Willi Soukop were her tutors. She later went onto teaching at Chelsea between 1953 to 1960, and at St. Martin’s School of Art from 1955 to 1957. She achieved commercial success at a young age in 1952, and later won her first major solo exhibition at Beaux Arts Gallery in London. This marked the beginning of a highly acclaimed career in which Frink earned her reputation as one of Britain’s most important post-war sculptors. As such, she was awarded Honorary Doctorate by the University of Surrey in 1977, Open University 1983, University of Warwick 1983, and University of Oxford 1989. In 1977, Frink was elected as a member of the Royal Academy. Her achievement also earned her a CBE in 1969, and in 1982 she created a Dame of the British Empire. She is also known for her monumental commissions which include several such as the ‘Eagle’ installed at the John F. Kennedy Memorial in Dallas, Texas. Her style of design is characterised by rough treatment of the surface so that each piece is richly embedded with the artist’s creative personal impression.